I've been seeing a lot of dessert hummus lately - on social media and in-store. I was a bit skeptical and decided to give it a whirl myself. 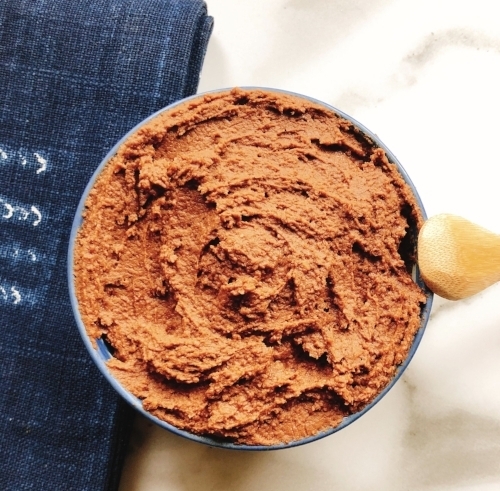 This Chocolatey Cacao Hummus I came up with did NOT disappoint! A cross between frosting and mousse-like texture, you can't beat this fiber and protein packed "treat." Most hummus recipes call for you to peel the chickpeas, but honestly, this seems sooo time consuming! I didn't peel the chickpeas for this recipe and it was D-lish. If you're looking for a silky smooth hummus texture, and you have some free time, you could certainly try peeling the chickpeas for this recipe - it won't hurt! I always order my cacao powder at Thrive Market, but you'll find it in most grocery stores if that's more your style. The rest of the ingredients I picked up at Trader Joe's or already had in my pantry. I am loving this Chocolatey Cacao Hummus on apple slices, pretzel slims, and Lundburg Family Farms Thin Stackers [AND also just with a spoon!]. In a food processor [you could also try a high speed blender], add chickpeas and blend for several seconds. Add remaining ingredients, aside from water, and blend until the mixture starts to come together. Add water, starting with 2 tbsp., and blend until desired consistency is reached, adding more water as needed. Serve with fruit, crackers, rice cakes, pretzels, etc. Enjoy!